Many people ask, "What year was Ringwood Manor built?" What they do not realize is that this seemingly-simple question has a complex answer! The house was built in several different stages over the course of almost a century. In its final stages, Ringwood Manor grew almost organically, as older parts were totally engulfed or joined together by new construction. Ringwood Manor is an ideal example of an American country estate that evolved over a long period of time so that its Federal, Italianate, Neo-Greco, and neoclassical components mix to create the structure that is seen today. The earliest wing of Ringwood Manor is a Federal-style, clapboard-sided house typical of those built throughout northern New Jersey during the years 1790-1820. 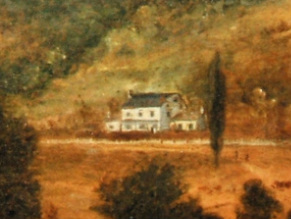 In approximately 1810, a couple of years after Martin J. Ryerson acquired the Ringwood property, the Ryerson family began construction of the western end of the Manor, known as the "Ryerson section." It is likely that this house had at least one attached kitchen wing, and its arrangement of rooms and many of its features seem original to that period. There was a side-set entrance hall with a staircase and two rooms to the left, which is seen on all three floors in this section. The double parlors on the first floor of the Ryerson section are separated by an elaborate "screen" that incorporates small closets or pantries, a large set of pocket doors, and architrave moldings enriched with decorated corner blocks and center blocks. This method of separating parlors is a traditional feature of the Federal-Greek Revival style of architecture. After construction of the Federal-style Ryerson home, the next major building project seems to have been a large "Romantic Revival" addition that joined to the earlier house in 1864. This time period was one in which both Gothic Revival and Italianate styles co-existed, and both were found in the building project of 1864. 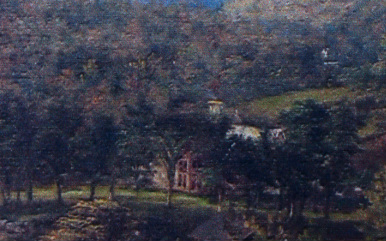 Though no photographs of the Manor during this time exist, there is a painting from 1868 that seems to show the building through a screen of trees. Small sections of the Manor depict Italianate features like a cupola in the center of the roof-line and tall, thin windows. Gothic features such as trefoil carvings are also depicted. In order to join the addition to the older building and to create some impression of "picturesque" massing, the 1864 section of the Manor is designed with large bays projecting from the front and back facades. Not only do these typically Italianate bays create a picturesque effect, they also introduce ample light into an otherwise windowless wing. Inside, vertical wooden wainscot with carved trefoil designs are found. No documents identifying the designer of the 1864 house have been found in family papers. 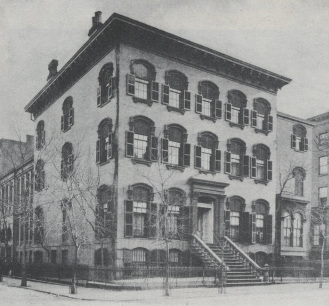 The first evidence of an architect's involvement was the building campaign of 1878, when the Hewitts hired Edward JM Derrick of Paterson to modernize and enlarge the 1864 wing. Derrick was practicing at a time when the Queen Anne style, known as "free classic," was popular. Its influence is apparent in Derrick's work at Ringwood Manor, particularly in the entrance hall. One of the hallmarks of the Queen Anne living hall was a more free-flowing plan and open interior. The architects of the period replaced the traditional center-or-side-hall-with-stair arrangement with an expansive living hall. In the best examples, this room incorporates not only a fireplace but an open staircase meant to be beautiful as well as functional. Derrick's "Great Hall" at Ringwood has a staircase that rises in the far corner of the room, where the entire back of the house was extended to include a new dining room wing and kitchen area. His grandiose living hall is clad entirely in matched parti-colored woods, so that the effect is dark and rich. The present patterned floors, primarily pine with accents of cherry, maple, chestnut and walnut, were also installed at this time. They were laid directly over the original floors in the Ryerson and 1864 wings. Derrick's remodeling is also the likely time for exterior changes which resulted in eclectic elevations characterized by a chamfered columned porch and porte-cochere, heavy barge-boards, stickwork overlays, and an oriel window at the front of the Federal wing. With these changes, the outside of the house presented a uniform face. Local tradition, supported in part by the written reminisces of sons Edward and Erskine Hewitt, describes Mrs. Hewitt's habit of moving various outbuildings from other locations near the Manor to form the servant's wing. The c.1885 photographs, which depict a variety of rooflines, plan shapes, and an adjacent outbuilding lend credence to this story. During a period of approximately 15 years, the east service wing was expanded to its present position, basements were excavated, new coal fired furnaces were installed, and toilet facilities were inserted throughout the Manor. 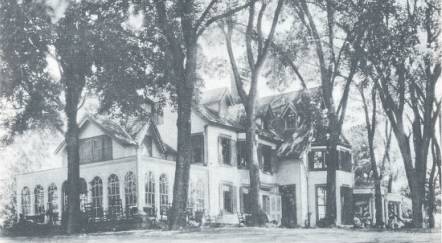 The next effort to modernize the house occurred c.1900. It has been said that Stanford White, of the firm McKim, Mead and White, worked on the exterior renovations of Ringwood Manor at that time. White and the Hewitt family were neighbors in the Gramercy Park section of New York City. He did major renovations to their 9 Lexington Avenue home after Peter Cooper's death, adding many neo-classical interior features and completely redesigning the entrance to the home. It seems plausible that White was also involved at Ringwood, especially considering his well-known neo-classical style. Neoclassicism was very popular among the wealthy at the beginning of the 20th century, and the Hewitts were no exception in this regard. On the exterior, by 1903 most of the c.1880 trim was removed, and the clapboard walls were treated to a coat of stucco in an effort to unify the building. The Ionic-columned veranda and porte-cochere were added. The most substantial alterations during this building campaign were the addition of the east wing as a complete, symmetrical 2 and 1/2 half story gable-roof. This included creating a gambrel roof over the 1863 wing, removing all east wing rooflines, and replacing the original structure with steeply pitched gables punctuated by dormers. Although these changes could not totally disguise the quirky evolution of the manor, they did impart a certain cohesiveness, though the Victorian eclecticism of the earlier building campaigns is still evident. During the final phase of construction (around 1910), the Victorian porch on the west side of the Manor was replaced by a conservatory (piazza) with full-length round-arched windows. Edward and Erskine Hewitt note that the windows came from Cooper Union at the time of a renovation there. These are identical in dimensions to some found currently at Cooper Union. The previously decorative brick-work chimneys were all rebuilt in their present, simple design. Inside, the neo-classical remodeling was accomplished by painting much of the woodwork and trim white which was paired with French decoration and furniture. Nonetheless, the building retains its eclectic nature, especially when considering the small sets of stairs that can be seen throughout the second floor. The Hewitt family owned two other homes: their formal residence in New York City and another summer home in Bar Harbor, Maine. 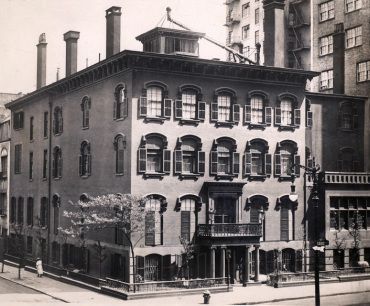 The home in the Gramercy Park section of New York City (9 Lexington Avenue) was later sold and demolished. However, architectural features of the building were salvaged and can be found at several other institutions today, including the Metropolitan Museum of Art and Cornell University. The Bar Harbor home known as "Reverie Cove" was sold by the Hewitts and still stands today under private ownership.